I’m not hungry for money. Compared to several years ago, when I had less money, I still have the same life. I wake up, drink my freshly brewed coffee, read a good book, and then start working until about 3 or 4 in the afternoon. Then, I put on my shorts and t-shirt and start working out. Sometimes I listen to music during my workouts, and sometimes I don’t. After working out, I have dinner with my family. We watch a TV show or movie after we eat. And then, I get back to working or reading. Of course, his apprentice was Warren Buffett, who’s one of the wealthiest people of all time. And after reading his biography, Snowball by Alice Schroeder, I’m pretty sure he’s also one of the most frugal people of all time as well. The man was notorious for his spending pattern. That is, he didn’t spend money at all! But if we look at Buffett’s strategy, we must admit that it works. Enjoy your simple life, save your money, invest it wisely, and don’t lose your money. That’s how you get richer every day. In the rest of this article, I explain how I apply this strategy in daily life. I keep my expenses as low as possible without sacrificing the quality of life. My apartment isn’t big, my mortgage is low and so are my energy and water costs. I drive a Fiat 500, and my car insurance is €26 a month. And I only fill it up with gas once a month because I live close to my office, friends, and family. I stopped buying fashionable items like gadgets and clothes that are “in.” But I must say, I don’t save on my wellbeing. I buy books every month. I eat good food. And I go to a good gym. And I also built a small gym in my office. You see, I don’t live like Mr. Money Moustache or minimalist folks, I have my own definition of living lean. That is: Don’t spend your money on things that don’t give you lasting benefits. For example, healthy food keeps me fit and lean. Books satisfy my thirst for knowledge and thinking. Working out gives me calm. Going on trips and holidays give me inspiration. And so forth. But you know why I’m not afraid to spend money? Too often, we despise greed — which is also an extreme state of mind. Strive for balance, my friend. Never spend more than you earn. But remember that life is too short to eat rice and beans. So we all know how to build wealth, right? Save your money and then invest it. That’s the idea. But before you even think about investing, you need a buffer. What will you do when your fridge breaks down? Okay, I admit it: that’s a cliché. Let me give you a better example. Let’s say you’ve experienced hardship for the past year or so. A family member passes away. You get ill. And you’re having less fun at your job. Things have been tough. Money buys freedom. We must be honest about that. However, you don’t need a million bucks to be free. Personally, I like to have €10K on my savings account that I can always access. For the first few years of my career, I worked hard and didn’t spend much money, so I could build up my buffer. And ever since I built up my buffer, I never let it dip below that number. I also don’t invest that money. I don’t care about inflation since I make money in different ways. My buffer is here to keep my mind at peace and helps me to do what I want. To me, that’s the definition of a rich life. Look, individuals like you and I never make money with stock trading. What’s more, professionals don’t even make money for you with trading. Just look at the results of fund managers. Few beat the market. And if they don’t, they will still make money for themselves — you’re the one who loses. And if they do beat the market, it’s probably because of luck. At least, that’s what Nassim Nicholas Taleb has been saying for almost two decades. For the past few years, I’ve become more risk-averse. I stopped investing in individual stocks. It’s too risky. Plus, when I own stocks of a company, I can’t help myself from looking at the performance on a daily basis. That’s why I put my money in index funds — where you’re essentially investing in a whole group of companies, bonds, etc. Of course, there is still risk involved. But at least I’m saving myself time because I’m no longer trying to “pick stocks,” which is a waste of time. If you want to learn more about index funds, I recommend reading The Little Book Of Common Sense Investing by Jack Bogle. I also made a booklist with the best personal finance books that I’ve read. Once a month, I buy more shares of the Vanguard S&P 500 ETF and that’s it. The cost is low, and the risk is also relatively low (when a company that’s on an index goes bust, it gets replaced by another one). I don’t trade ETFs, and I don’t look for other “better” index funds. That’s my whole investing strategy. It can go up, it can go down, but at least I’m not bothered by it. Let’s be realistic, the return I get from the index funds is NOT income. In fact, I don’t try to make money with investing. Let me ask you this: What’s the purpose of investing? To me, it’s not about making money. It’s about building wealth. And those two things are very different. I invest for my retirement. That’s about my future. I make money by working today. I do that in different ways. I own a software automation company together with my family, I offer online courses, books, coaching, and I own two properties. So instead of spending hours trying to diversify your investments, diversify your income. That’s the biggest mistake people make. They rely on one income stream. And even if you have a job, there is no excuse to only rely on your employer for 100% of the money you earn. Think about it. 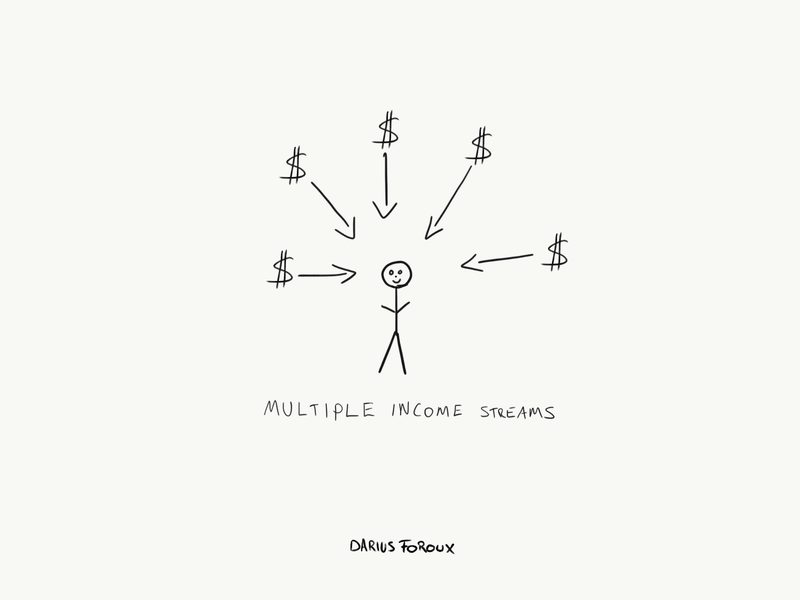 Why does your money come from one stream? Is that your strategy? Why? Forget about active investing and diversification — that’s for the delusional or the professional. Generate more money. Sell something online. Rent out your apartment on Airbnb and go live with your parents on those days. Provide value in exchange for money (listen to my podcast episode about it if you’re interested in blogging as a career). Do what it takes. Generate cash. Then, invest it in assets. Buy real estate. Rent it out. But don’t take it too lightly. “Yeah, I’m going to buy an apartment right now and immediately rent it out!”If it was so easy, everybody would be rich. The world has changed. Banks don’t lend money easily. You need income. Everybody dreams of having passive income but that’s only the second stage of your financial strategy. First, you make money, and then, you invest it. And after that, money itself will take care of the rest.